Choreographytogo has been running the Level 3 Pilates Matwork Diploma with Active IQ for over 9 years. We offer a modern, forward thinking and intelligent course giving our learners the full qualification syllabus plus additional training in Functional & Progressive Pilates, Small Equipment/Special Populations, Business Building plus ongoing support post course dates with our Level 3 Pilates dedicated online portal and student Facebook group. Before attending the Level 3 Course you need to attend Pilates classes and be familiar with the exercises. You will also have to do homework and preparation before the course begins – Attendance of all 3 live days is compulsory. You are required to sit an exam during the course to gain your certification. Both Kelly and I can’t stress enough to come to the course prepared. Make sure you have watched the Level 3 online videos, you have printed the manual and read through and attended as many Pilates classes as you can. This will all help you so much when you attend and which is why we send the DVD and manual beforehand. Level 3 Pilates is a fantastic qualification and one that is held in high regard within the industry, therefore prepare and you will be able to enjoy the course and get the most out of it. It is imperative you attend Pilates classes as a participant before you attend the Level 3 Training. A log in to the Level 3 Online Video Dashboard featuring Rachel Holmes and Kelly Reed. Level 3 Manual as a Downloadable Document you will need to print this off, read and bring to the course. No hard copy manual is posted to you. You will also film your assessment using your own class members and send the DVD in. This cuts down on travel time and days away and ensures you can film your class in an environment you feel comfortable in and show your teaching in a more natural environment. Do you want to be a Level 3 Pilates Instructor? Anyone that would like to teach Pilates – You don’t require any prior fitness qualifications to take this course. Fill in the portfolio (LAP) – After completing the 3 days you will prepare a case study on 1 person including plans/progressions and options through 6 weeks of lessons. You will par q the group and document how you progress them. This is a simple process and once we show you how to fill in your portfolio is very straight forward and logical. You can even use an existing class that you have going. As long as you fill in the correct details you can easily complete this part of the portfolio. Teaching Practise – Teach Backs and Teaching to the Group. Posture Assessment and Movement Screens. 1. I hold a Level 2 Pilates Qualification – Do I have to attend and pay for the whole course if I want to be Level 3 Pilates Instructor? Yes, You have to attend and complete the 3 contact days. 2.I have no Pilates experience but I am a qualified Level 2 ETM/GYM Instructor can I attend this course? Yes, as there is no longer a Level 2 Pilates qualification only Level 3, the course is suitable for all qualified Instructors. 3. I have passed my Level 3 EFK (Exercise and Fitness Knowledge Paper) within the last 2 years do I have to do it again and can I get a discount on the course fee. If you already hold the Level 3 EFK then you don’t have to take this again. Unfortunately, we are not able to discount the course fee. 4. Is your Level 3 course an “official” Pilates course? 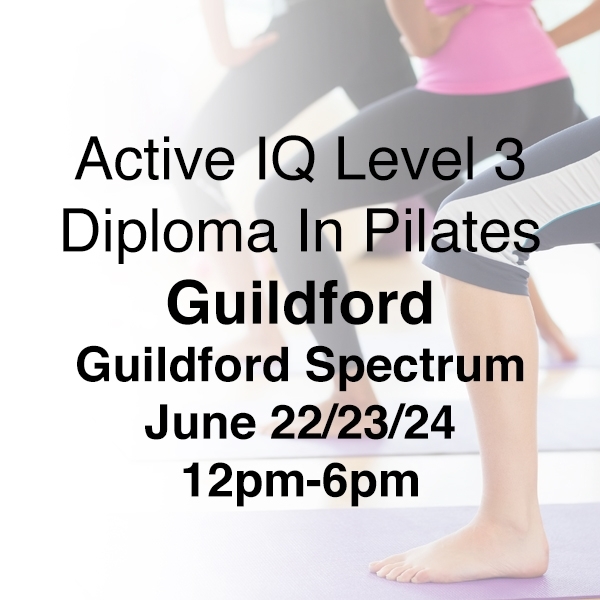 Yes the Course is an Active IQ Level 3 Pilates course and you gain entry on the REPS register at Level 3 and get 20 CPD points. 5. Once I have qualified am I able to call my class Pilates? Yes, You will be a Level 3 Qualified Pilates Instructor. 6. Am I able to pay for the course in stages? 7. Do I get any other course materials with the course? Yes you will receive 1 Level 3 Pilates DVD and PDF manual. 8. What is the course timetable?